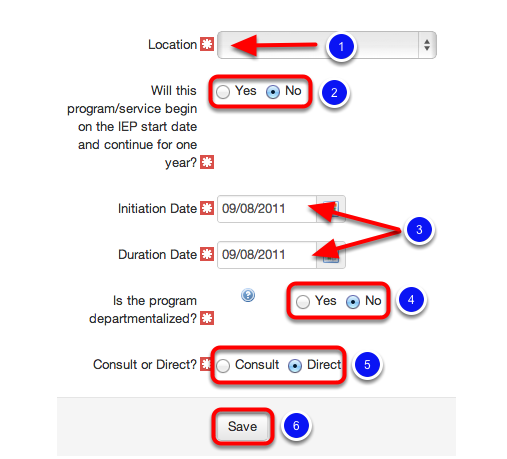 From the IEP Wizard Quick Resume Menu, select IEP Wizard Program/Service Details. Click the Add Program or Add Service link to add a program or service to the student's IEP. Note: The following steps are identical for adding a program or service except for the options available in the first drop-down (Program Code or Service Code depending on what is being added). 1. 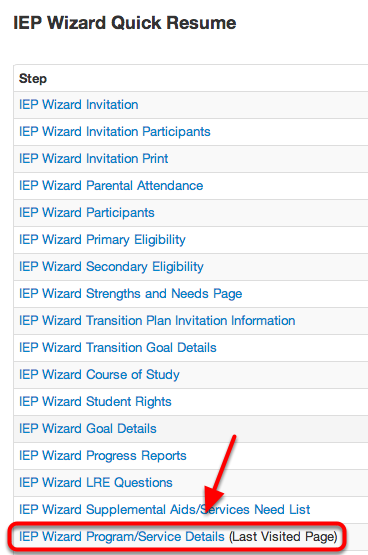 From the drop down menu select the Program Code for the program that you wish to add to this student's IEP (e.g. Elementary Resource Room-ERR, Homebound/Hospitalized, Severe Multiple Impairment- SXI, etc.). 2. From the drop down menu select the Site at which this Program will be offered/provided. 3. Use the drop down menu to select the person who will be the Provider of the Program. 4. In the Time/Frequency field enter the time and/or frequency that the Program will be offered/provided. 5. In the provided field enter the minimum hours per week the student will participate in the designated Program. 6. In the provided field enter the maximum hours per week the student will participate in the designated Program. 7. In the provided field enter the actual (average) hours per week the student will participate in the designated Program. 8. In the provided field enter the number of hours per week the student will be away from his/her non-disabled peers for this placement. 1. From the drop down menu select the location in which the Program will be offered/provided (e.g. General Education Classroom, Special Education Classroom, Home, etc.). 2. Indicate Yes or No as to whether the Program will begin on the IEP start date and continue for one year. 3. If No is selected from Step 10, use the Date Picker to select the Initiation Date (date program will start) and Duration Date (date program will end). 4. 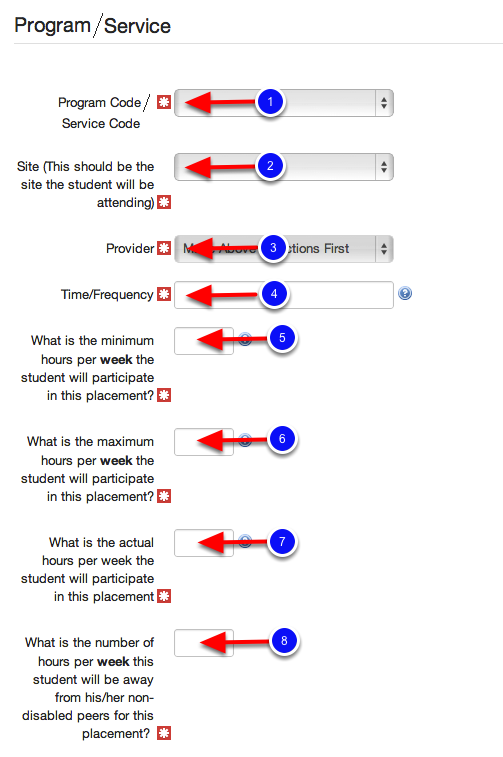 Choose Yes or No to indicate whether the program is departmentalized. 5. Choose Consult or Direct to indicate how the Program will be delivered. 1. Make changes to the Program/Service by clicking on the Edit link. 2. Open the Program/Servicein a read-only format by clicking on the View link. 3. Click the Delete button to remove a Program/Service from the Programs/Services page. Once you have made any necessary additions or modifications click the "Next" button. Once you have added the student's programs and services you are ready to move on to the State Assessment section of the IEP. For more information on how to complete the State Assessment Details section see the "State & District Wide Assessments" chapter in this manual.